Added on February 2, 2015 by J.D. Magers. This image here is going to be one of the more controversial for my portfolio book. It certainly was in the feedback I got from the two people I had edit my choices. There is just something about this photo that appeals to me. I don't even think the subject here is the bird, even though that's what it was intended to be. I think the true subject that came out of this photo is the red wing. There is just enough detail in that red, and in the flapping wings to make this photo look awesome. It ended up being a little, well, abstract, and I'm okay with that. 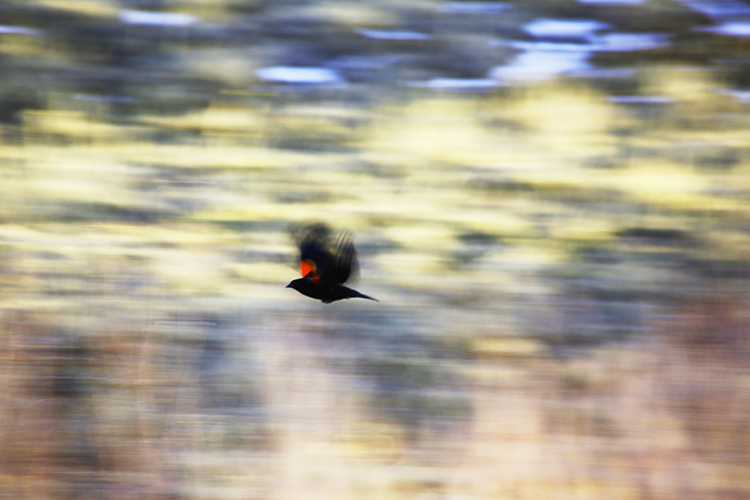 Abstraction of a Red Winged Blackbird trying to get away from me.